Needless to say, that caught my attention. I turned and saw two students on the front row looking at the course textbook — Carole Rich’s Writing and Reporting News: A Coaching Method. “I really like it, too,” the other student said. This was a discussion I had to get in on. So I joined them. “What do you like about the book?” I asked. The writing style was easy to read. One student had expected to spend several hours of tedious reading to complete the assigned chapters, but she was delighted (really) to find the reading easy and engaging. The examples were included throughout the chapter and were helpful. “I was able to write the news story you assigned by reading the examples,” one said. “Usually all the examples are at the end of the chapter. By the time you get there, you’re tired of reading,” the other said. Terms were explained, they said. The chapter was divided into chunks so students could read the heading and then focus on getting that concept (for example, Changes in Online News). I told them I’d appreciated their feedback. Like other faculty members, I spend time every semester in considering which textbooks to adopt for the next semester. I want to use a textbook that can help me in teaching the course and that is a reasonable cost — although it’s getting more difficult to find a reasonable cost for most textbooks. 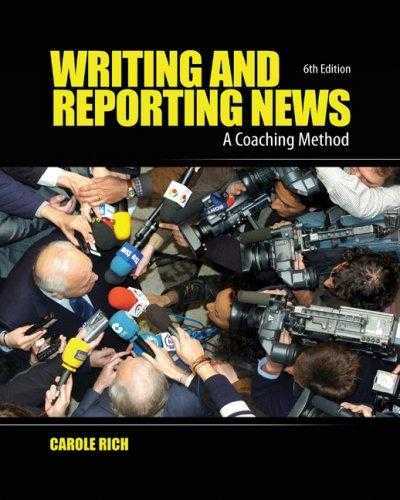 Writing and Reporting News (paperback, 531 pages) is $87.64, on sale at Amazon, reduced from $114.95. And that’s not the only required book for Writing for Mass Communication. They also need Kessler & McDonald’s When Words Collide and the AP Stylebook. If you teach a media writing course, what textbook(s) do you use?